Families Welcome in Flinders Park! As soon as you arrive at 23A Simmons Cres, you’ll feel at HOME. From the moment you step from your double garage you will be impressed by the well planned and open family, living and entertaining that spills through to the outdoors. Built in 2012 on approximately 182sqm, this home is the perfect size and style for a family looking for something that is immediately move in ready and easy care. First up, a modern and stylish kitchen at the centre of the hub – the cook will never feel left out as you are in touch with huge pantry, laundry, lounge/dine and outdoor living. Featuring breakfast bar and the secret walk in Laundry. Extra size pantry will give you enough space to feed the troops. Together with the open plan Living/Dining area, it’s the perfect family hub for both entertaining and comfortable everyday living. The light and airy space with aesthetically pleasing neutral tones and polished tile floors, flows on out to the spaciously inviting backyard. Whilst it has joint walls to the neighbouring properties – the construction is of noise reducing Hebel, a superb and popular product that will minimise noise. Overlooking Linear Park the rear yard is both easy care and perfect for the glass of wine with wonderful landscape of trees and water. Take your bike to the city, beach or any one of the wonderful parks along the track. You can even take the kids for fishing within metres of your rear gate. Venture upstairs for the sleeping quarters. Not many properties have 4 bedrooms and can still claim to be easy care. 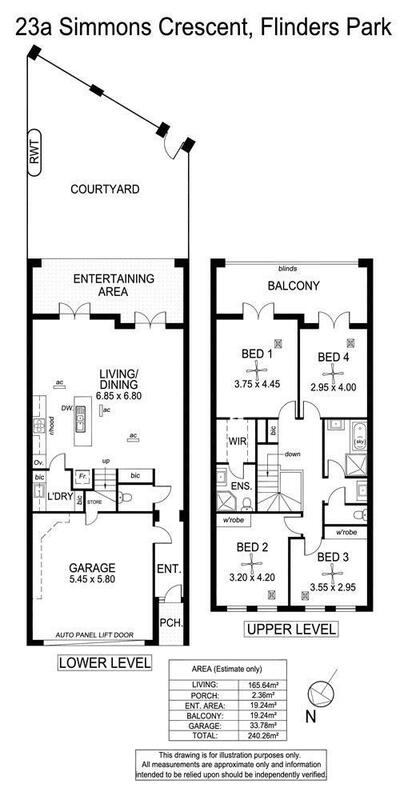 The master bedroom has your ensuite and walk thru robe, beds 2 and 3 have built in robes and bed 4 is versatile for an upstairs nursery (next to the master) or even a kids play room or study. The whole house is serviced by an inbuilt vacuum cleaner to make life just a little bit easier and is serviced by a 3kw solar system to keep the costs down. The master bedroom and bed 4 will impress the most discerning buyer as it has its own private and surprisingly large balcony with stunning views over the River Torrens and environs. 23A Simmons Cres is wonderfully central between City and coast, so you’re within a 10 minute drive to one of Adelaide’s most beautiful beaches. Minutes to shopping, great restaurants and you’re within very close proximity to a number of schools including Flinders Park and Kidman Park Primary Schools and Findon and Underdale High Schools. So… do NOT wait another minute! Rally the troops and call Paul McGrath or David Monfries NOW! !